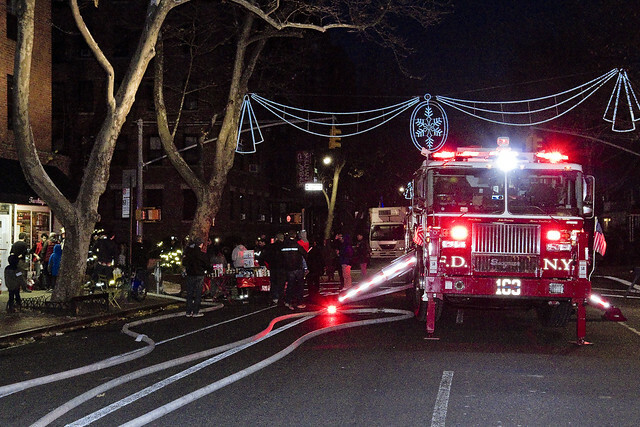 Santa Claus, Sunnyside, the Turks, and FDNY Ladder 163 – in today’s post. 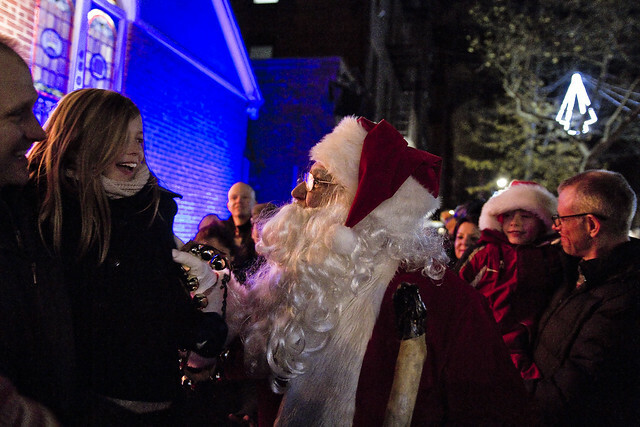 Celebrating the forthcoming Saturnalia, on a stretch of Sunnyside’s Skillman Avenue, the community received a visit from Santa on Saturday the third of December. There was a street fair sort of thing, and all the local small businesses welcomed the arrival of both Father Christmas and the shoppers who followed him. The whole thing was orchestrated and underwritten by the office of Jimmy Van Bramer, the Sunnyside Chamber of Commerce, and I think there were other donors but didn’t pick up on who they were. The owners of Flynn’s, Quaint and Claret, and the Dog & Duck all slept happily that night – I’m sure – after watching their establishments grow absolutely full to the gills with merry making community based customers who were lured over to Skillman Avenue for the event. Even the Turks, who aren’t exactly Christmas people, got in on the show. 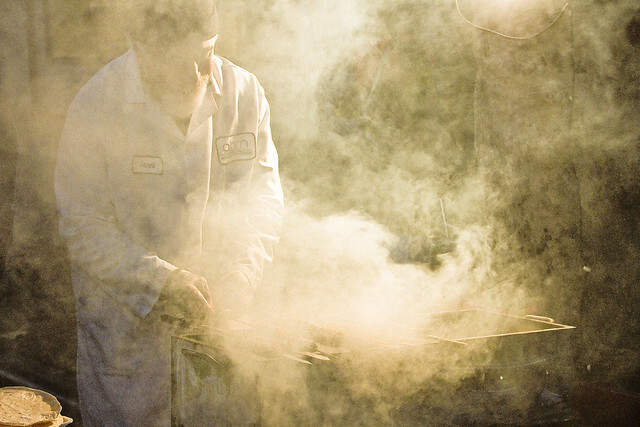 They were grilling kebabs – or whatever the Mediterranean grilled meat on a stick standard is called in Anatolia – on a smoky BBQ. I was asked to come and photograph the event by my friends in the Sunnyside Chamber of Commerce, and did my standard “thing” at public events when behind the camera. Part of my “thing” is this – always take pictures of kids, dogs and the food. I moved back and forth between 51st street and 43rd street on Skillman Avenue, which was closed to traffic due to the pending arrival of Santa and the concurrent lighting of a tree at that little church on the corner of 48th. I will admit that this sort of event photography ain’t exactly exciting for me – I mean… it’s not like something visually “exciting” is going to happen at a parade or street fair. On one of my passes, the smoky Turkish BBQ pictured above had disappeared. 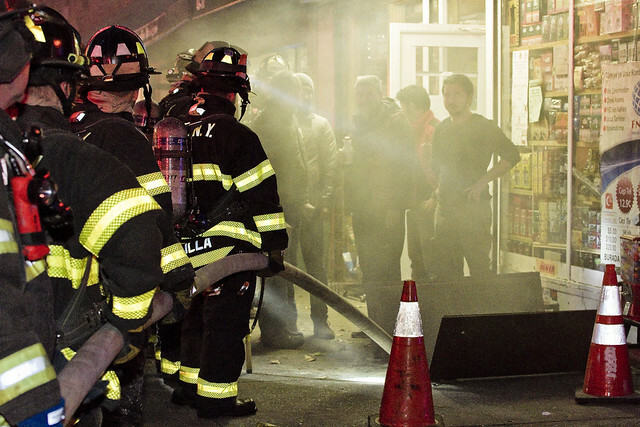 The smoke liberally painting the air was now billowing up from their sidewalk basement gates, and FDNY had arrived on the scene. 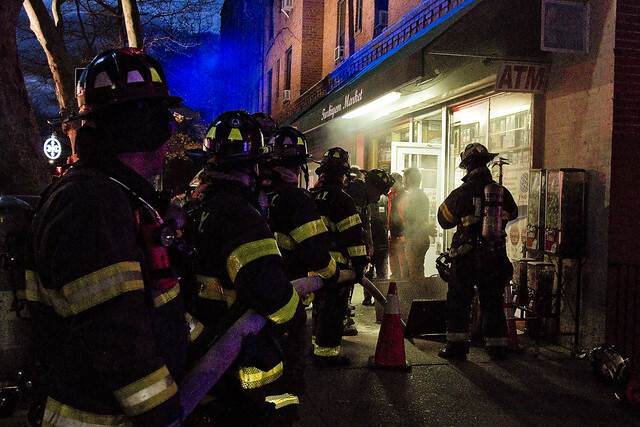 As mentioned in the past, I was the Brooklyn kid who ran down the street yelling “Firemen, Firemen” whenever an engine or ladder truck screamed past. Nothing has changed for me, despite the passing of multiple decades. 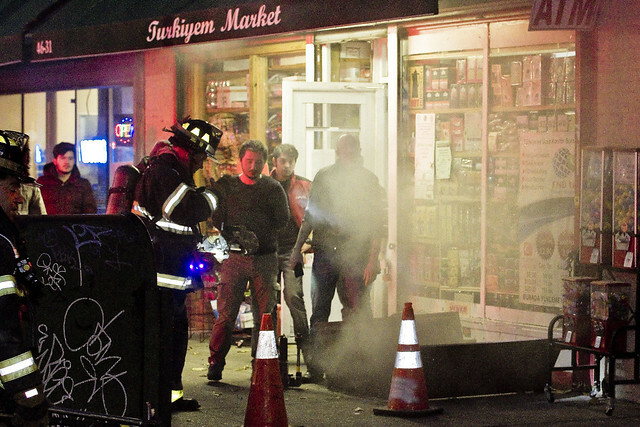 A minor blaze had broken out in the basement of the Turkiyem Market, it seems. 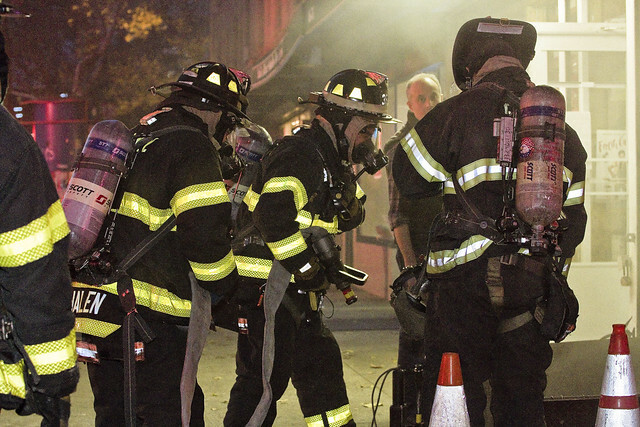 Ladder 163 was called to the scene, along with their partner unit Engine 325 – both are stationed at the same firehouse and they call themselves the “Woodside Warriors.” The two units were discussed a couple of weeks ago, in this post. 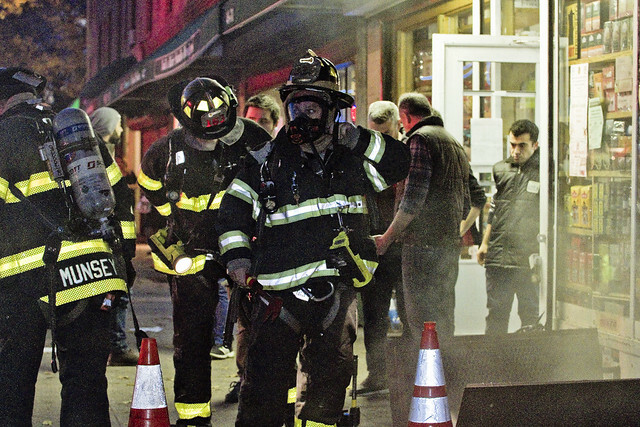 Given that this was a street fair, ultimately, the normal crowd control stuff they do didn’t apply and this was a rare opportunity to get in close and observe while FDNY did its thing. Saying that, I wasn’t “that” close as I was using that new zoom lens of mine – the Sigma 50-100mm f1.8. I also swapped in another Sigma lens occasionally, which was an 18-35mm f1.8. Periodically I fired off the flash for a bit of extra light, but I’m trying not to use camera mounted flashes these days. These two Sigma lenses are now the core glass in my “NYC night kit,” btw. The FDNY folks firehoses (monitors?) were charged up with hydrant water, but from what I surmised, the initial wave of personnel who went into the basement had managed to quell things using hand operated extinguishers. I suspect that they probably squirted a bit of water around down there anyway in the name of conquering any “hot spots,” or areas which might reignite. 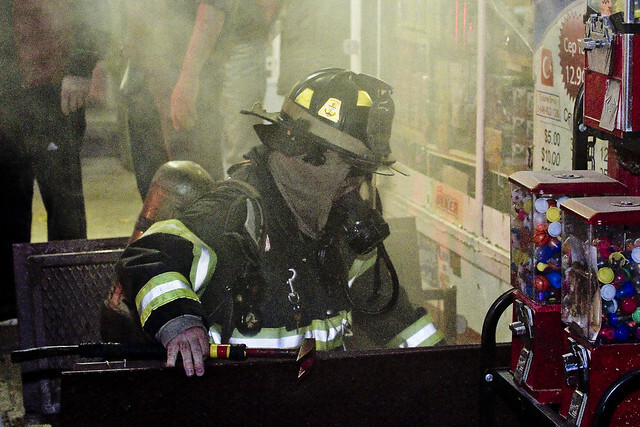 BTW, I question “monitors” above as that’s what you’d call a fire suppression hose and nozzle on a boat. If any of “youse guys” are on the job, let me know what you call a fire hose in the comments. The comedic potential of the preceding sentence is acknowledged, but keep it clean – this is a family blog. It was all terribly exciting. 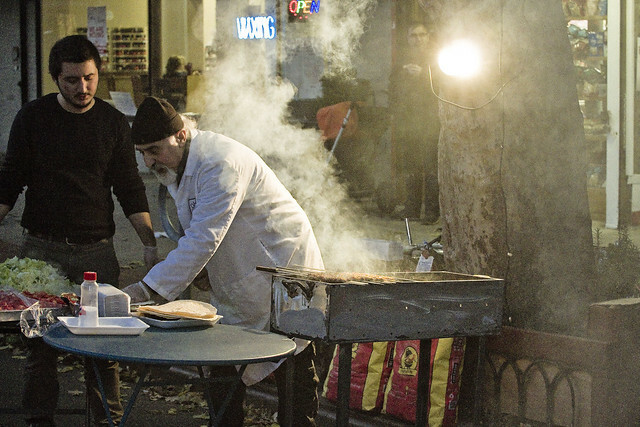 The crisis was averted, and Sunnyside got back to the holiday season. Jimmy Van Bramer lit a Christmas tree at the church, kids sang holiday ditties, and eventually Santa showed up despite being around 25 minutes late. It seems that Santa got stuck in highway traffic, which amplifies the message on a bit of common knowledge held by all New Yorkers. Nobody, and I mean nobody, beats the Van Wyck. Not even Santa. You got paid or was the work “pro bono”?